A battery acid burn can cause skin damage, especially automotive batteries that contain sulphuric acid which are used to produce electric current. Some people suffer burns from battery acid if not carefully handled. Battery acid burns are categorized as chemical burns that usually happen in battery manufacturing units. Batteries can explode if an individual does not handle it properly and when the acid is splashed accidentally and comes in contact with the skin or eyes. Immediate attention is needed in order to minimize damage. Sulphuric acid is a corrosive chemical and can cause death of the tissue cells when in contact with the body, but it depends on the strength of the acid and how long it came with the skin. Majority of cases of battery acid burns is limited to the superficial level of the skin. Check the area which come in contact with the acid and if the acid was spilled on the face, chest as well as hands or feet, flush the battery acid burn with plenty of water for 15 minutes. Water will dilute the chemical nature of the acid and help reduce the strength and avoid using small amounts of water when flushing the acid on the skin because it will spread the acid to the surrounding skin without reducing the strength and will worsen the burn. Remove clothing and jewelry that came in contact with the acid to help ensure that the acid does not have the chance to contaminate other areas of the skin and worsen the problem. If acid is splashed in the eyes, lay the affected person flat and keep the eyelid open and run a slow flow of cool water over the eyes and continue at least for 15 minutes. After flushing, seek medical care right away. Try to keep the individual calm. Use flowing tap water when flushing the battery acid burn. Avoid using ice cold water since it can worsen the damage and burning sensation. When the burning is minimized, wrap the affected area with a clean, dry cloth such as a thick sterile gauze pad. 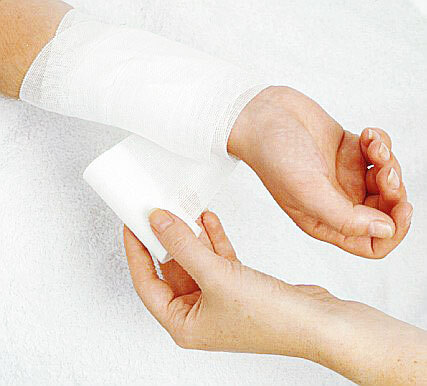 Always use dry dressing in order to prevent contamination of the wound from foreign elements such as mud or dust. Take anti-inflammatory medication in order to help minimize pain and swelling. After two to three days, apply aloe vera gel which possesses both mild analgesic property and also an antibacterial action that is useful for the healing of the acid burn. If there are changes in skin color and the eyes are red and swelling, it is best to seek medical help immediately. An individual with battery acid burn should be given appropriate first aid care and then seek immediate medical attention for further care.